If two cutting surfaces are good, wouldn't four or even eight cutting surfaces be even better? Simple logic tells us the answers is yes. 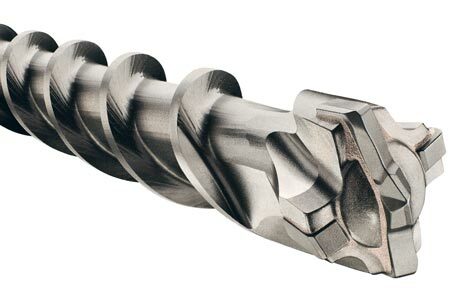 So when Bosch comes out with a new concrete bit that has more carbide teeth, we can only expect better cutting results. While most carbide concrete bits have a single strip of carbide that offers two cutting surfaces, the Bosch SpeedX bit has two strips of carbide that offer four cutting surfaces. The SpeedX also goes a step further and offers four side cutting surfaces as well. Cutting the concrete is only half the battle though. All of those teeth do a good job, but there is still the issue of clearing the hole of dust and debris during the drilling process. With previous bits, clearing the hole often required users to plunge the drill up and down to help with the dust removal. This often added quite a bit to the drilling time. The SpeedX looks to have the answers to this problem; by utilizing a shortened head design and enlarged dust clearing channels, Bosch says the SpeedX performs better as the hole gets deeper. All of these new features give the SpeedX a 20 percent faster drilling time, and a bit that is 18 percent more durable then any other concrete bit available. Time is money; so I am always happy to read about new products that take things to the next level and offer a quicker answers to our problems. Video after Read More.